Did you know that Cafe Bustelo is the best selling espresso brand in the US? I had no idea until recently, primarily because this is a brand that is really only distributed in New York and Florida markets and I never see it in stores out in California. It is hugely popular for making Cuban coffees, so since the company is moving into the refrigerated beverage market with the new Bustelo Cool. 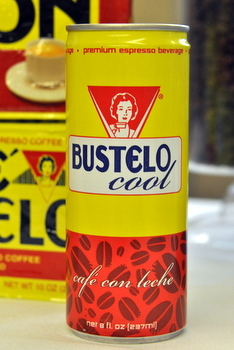 Bustelo Cool is a cuban-style cafe con leche made with intensely flavored coffee (Cafe Bustelo espresso) that is sweetened with sugar and given a splash of milk. I’m already a fan of cuban style coffee, and this drink delivered. I really appreciated that you could taste that dark, smoky espresso note clearly even with sugar and milk added. It was well balanced, not too sweet (my pet peeve with packaged coffee drinks) and really stood out from similar coffee drinks already on the market. Of course, if you want your drink to be super sweet, than Bustelo Cool probably isn’t going to be your favorite. Chill the can as much as you can, because the drink isn’t quite as good when ice has melted into it and thrown off the ratio of coffee to milk. There is also a mocha version out there, which I’ll be keeping an eye out for.